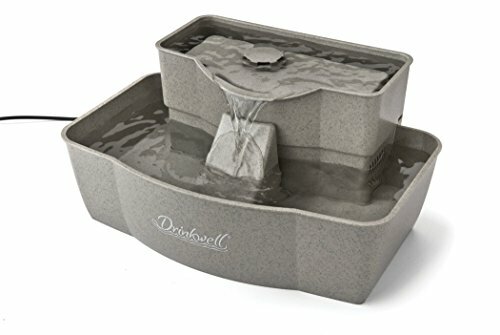 The PetSafe Drinkwell Multi-Tier Pet Fountain provides your cat or dog with 100 oz. of fresh, filtered water. It helps keep your cat or dog hydrated by providing multiple areas to drink with lower and upper bowls. The upper bowl is elevated making it ideal for senior or arthritic pets. The free-falling stream aerates the water, and an activated carbon filter removes bad tastes and odors, helping your pet stay hydrated and healthy. A: No. This fountain is designed for indoor use only. Q: Are there replacement pumps available? A: Yes, replacement pumps are available. Before purchasing a new pump, be sure to take your current pump apart and clean it. Pumps will get clogged with pet fur from time to time so it's important to regularly clean them.